It’s so hard to believe that we get to meet this baby boy in less than a month (I will be full term this weekend!)! It feels like I’ve been pregnant for years…but at the same time it feels like it’s absolutely flown by. But seeing the nursery all set up has definitely made reality sink in for us. Originally we were thinking we’d put baby in a corner (ha!) of our bedroom. It was a nice idea and all, but when we started getting all of the STUFF that comes with babies I realized we would need an actual room to store it in. So our office got moved to another part of the apartment and the nursery design began! I had a beautiful baby shower at the end of February, so now we’re all set and it’s time to show off the finished product! I’m going to give CeraVe baby a try. I’ve had such great success with the line on my own skin (see posts here & here) that it felt like a natural first choice. I also have a few key items from Mini Organics, an organic skincare line out of Australia. Then I’ve got products from the natural lines Substance and Burt’s Bees to try – they’re travel size so they’ll be occupying the diaper bag and car at first. We got our beautiful crib and dresser as gifts from my grandparents. They’re from the NYC company Oeuf – they use all natural and renewable and toxin free materials to build and treat their products. That’ll be even more important when baby starts teething on the crib rails :). Don’t you just love these wall decals?! I wanted to add a little something special to the room, but since we are renting I was pretty limited. Etsy to the rescue! I ordered the decals from Little Moose Decals. 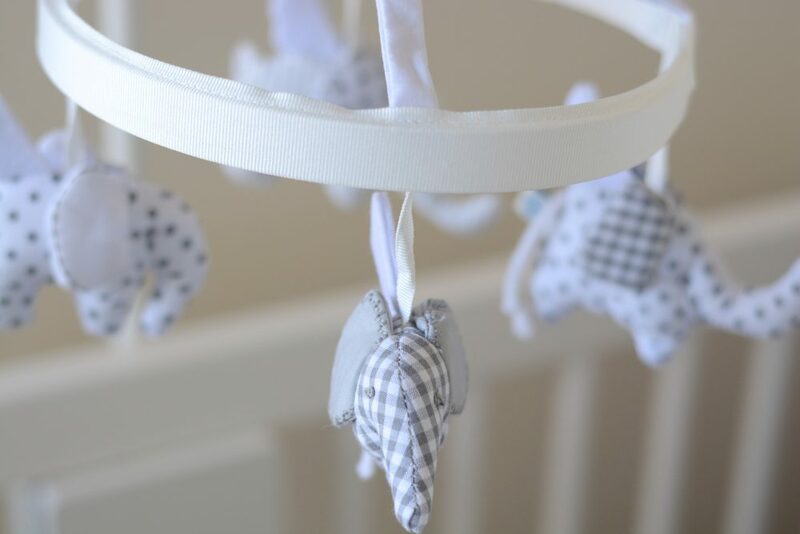 As you can tell we have a bit of an elephant theme going on here, and this Pottery Barn Kids mobile has to be one of my favourite pieces. It even plays twinkle twinkle little star as it rotates!!! The baby book collection makes me nostalgic for my childhood. We’ve got some great classics! Aaron’s parents are responsible for a lot of these (his mom is an elementary school teacher). And my mother agent, Liz Bell, gave us the book on how to talk to kids – I highly recommend it! The much loved Aden and Anais swaddlers! Baby shoes. They get me every time. The 4 Moms Rockaroo was a gift from my parents. I’ve read so many amazing reviews on it, and I’m hoping with all my heart that baby VDB likes to be rocked – because this will definitely be the reason I get time to shower. They also got us this awesome Stork Craft Custom Tuscany Glider and Ottoman – it actually took my mom and I forever to hunt down a grey and white rocker to match the nursery theme. We ended up finding this one on Amazon.ca! I got the side table from Ikea, and it has that nifty second layer that I can use to keep snacks close by for late night feedings. I finally decided on the Diaper Dekor for our diaper pail. So much of my research found moms saying that their diaper pails didn’t keep the smell out, which kind of seems like a pretty important quality for these things. This guy seems promising, but only time will tell! And it was also important to me that it have a foot pedal (so I can keep one hand on baby) and a lock for keeping a curious toddler out of it in the future. At the very least it’ll save us from taking 10 trips a day to the basement dumpster. The diaper drawer :). I’m a little bit proud of this guy. I got the drawer dividers from Ikea, and I organized diapers by size (with some more newborns in the diaper caddy) and products by purpose. I’ve got rubbing alcohol, q-tips, lotions, diaper creams, spare hand sanitzer and spare diaper wipes. And yes, those are pee-pee teepees. I am sure I will still get pee in the face at some point, but it’s worth a shot, right? I made up these little bottles for my diaper bag and to stash in the car. The polka dot one is filled with rubbing alcohol so that I can spray down change tables pre-change and clean change pads post-change (I’m a germaphobe). The larger one is filled with 3 parts water and 1 part baby detergent to use as an on-the-go spot treatment. For breastfeeding I just got a Boppy Bare Naked pillow and then purchased this super cute chevron Boppy cover from Etsy – such a dangerous place for engaged women and pregnant women. That’s the gist of it! After scouring the web for checklists and talking with other new mamas I think I can say we’re officially ready for this little human. So come on baby! PS I couldn’t name everyone who gifted us something seen in these photos in this post, but you know who you are and that we love you and your precious gifts – thank you!